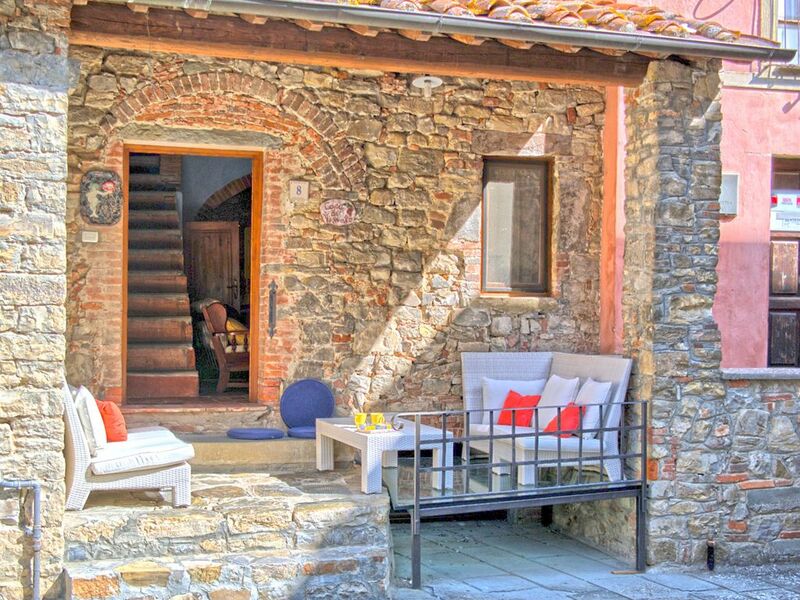 Property Casa Di Vignolo is a beautiful stone building (130 sq m) that includes air conditioning and WiFi internet. The property can sleep up to six guests comfortably in three bedrooms with two bathrooms. Casa Di Vignolo is located in the centre of Pergine Valdarno, Italy and only 20 km (12 mi) from Arezzo in the tourist area "Arezzo And Surroundings". Near the property there are local shops where you can find fresh produce and other items. If you can't find what you need locally, there is a shopping center located 13 km (8 mi) from the property where you can purchase your food and personal items. After arriving at Casa Di Vignolo you’ll find a nice clean well-maintained property perfect for a peaceful vacation in Tuscany. After a hectic day of shopping, spend some time with friends and family enjoying a glass of wine - a perfect way to unwind at the end the day. A real time-saver is having a washing machine on the premises that is available for the guests to use. If you enjoy cooking for family and friends there is a well-equipped kitchen including coffee machine, microwave, toaster and refrigerator, as well as, plenty of tableware and cutlery for up to six people. Most people enjoy visiting nearby cities and towns while on vacation, so for your reference this is a list of popular places with driving distances from the property: Arezzo 20 km (12 mi), Cortona 44 km (27 mi), Siena 50 km (31 mi), Greve In Chianti 58 km (36 mi) and Montepulciano 62 km (38 mi). The highway is only 8 km (5 mi) from the villa and there is a train station 3 km (2 mi) away. Pets Welcome - If your pet is travelling with you on holiday that is not a problem at Casa Di Vignolo. If you have a large dog or multiple pets, please ask for permission prior to booking. Over the years our guests have commented that the best part of their trip was the time spent with the family cooking and learning about traditional Tuscany cuisine. Please contact us if you need further information. Cooking Lessons - Learn from a local chef the techniques required to master Tuscan cuisine. The owner can schedule to have a chef come to the property for a cooking lesson for any number of people in your group. It's a pleasant way to spend time with friends and family while discovering the secrets required to prepare mouth-watering Tuscan meals when you return home. For more details and the supplemental cost, please contact us. Professional Chef - Are you looking for a real treat during your holiday? Why not book a professional chef to prepare and serve you a delicious meal using local produce? The chef will organize the meal based on your preferences and dietary needs. The chef will offer advice for the various courses and the wine. Ask for more details and the supplemental costs. Tours - Custom tours can be arranged by the owner for your group. For more details about the tours available, speak to the owner after arriving or ask prior to booking. The cost will vary depending in the exact tour and number of people. Pre-Stocked Fridge - Take advantage of the pre-stocking service to save time and start your holiday hassle-free after a long trip. Ask for more details, including the extra cost and how to organize this service. Including: kitchen + living room, bedroom + ensuite bathroom, service room. Kitchen + living room (40 m2): well equipped kitchen, dishwasher, microwave, italian coffee machine, sofa, two armchairs, fireplace, WIFI internet, mosquito net, satellite tv. Bedroom + Ensuite Bathroom (25 m2): king size bed, WIFI internet, mosquito net, basin, toilet, bidet, shower. Bedroom 1 (14 m2): double bed, WIFI internet, air conditioning, mosquito net. Bedroom 2 (16 m2): two single beds, WIFI internet, air conditioning. Bathroom (5 m2): basin, toilet, bidet, shower. Patio: al fresco dining, WIFI internet. Available to all guests: generic room. I would highly recommend renting this house. It's in a great little village with walking distance access to a market, shops and bar. The house itself is amazing...built in the 1200s with original fireplace and other unique things. Everything was very smooth with check in and assistance from the owners. We stayed for a week in August 2018, this a great home away from home and an ideal base to explore Tuscany. You really get a feel for Italian life in a small village. The house is located in the piazza within walking distance to a restaurant, coffee shop, grocers, bank, pharmacy and butcher. Plenty of free parking close by. The house is clean and spacious, with lots of character, a fully equipped kitchen, living room with fireplace, washer, air conditioning for the hot months, etc. We cooked dinner ourselves a couple nights using ingredients from the local stores. Few people in town spoke much English, but it was fun to communicate and they were all friendly. Comfortable and serene place to come back to after visiting the sites of Florence, Siena, Chianti and many other places during the days. Irene was a wonderful and welcoming host, and her hospitality was exceptional. We scheduled a cooking class with Irene and her brother Edoardo, which was the highlight meal of our trip. We would stay here again in a heartbeat when returning to Tuscany! Exceptional house....we stayed in number 8 for 6 weeks. The warmth and efficiency of the hosts were excellent. The house very quickly became home. Everything from the home, the cooking class, the determination of the hosts to ensure we and all others on holiday there, spent the best and happiest and most fulfilling time there was above and beyond service. I would stay there again at any time. Wat een geweldig leuk huis, volop ruimte alles is aanwezig en het heeft een zeer bijzondere sfeer.